Sideshows featuring humans with oddities was a grand source of entertainment for quite some time in our history. And has since been the source of inspiration for many stage, literature, and film features. Taking the life of Myrtle Corbin, the Four-Legged Girl from Texas, Lily Ali-Oshatz has crafted an extraordinarily ambitious a cappella musical about this extraordinary human in The Extraordinary Fall of the Four-legged Woman. Following the life and love of Myrtle, this musical finds that despite what’s on the outside, love is truly on the inside. Ali-Oshatz uses a sideshow as the structure of her piece. 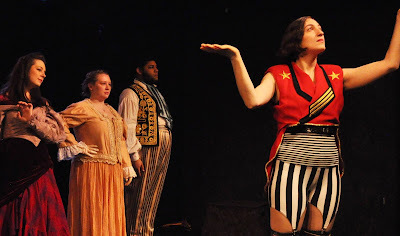 With M the Ringmaster, an androgynous figure, and her creatures as the star attractions, a young man becomes enamored with Myrtle, tempting her with a life away from the show. 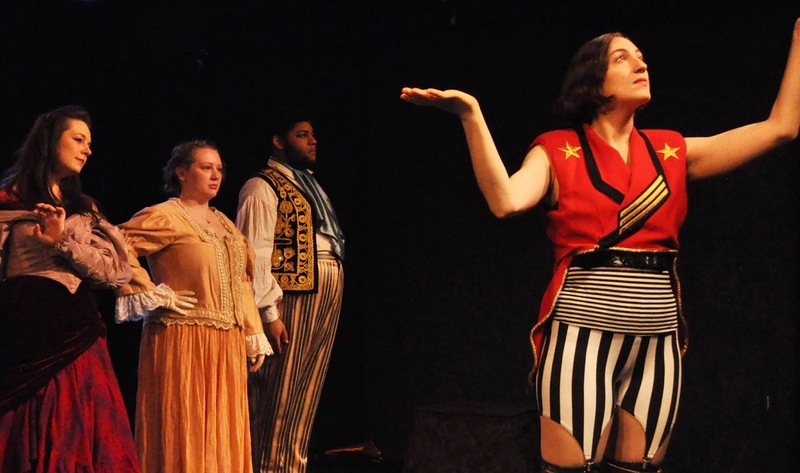 With another notable musical about a sideshow, Ali-Oshatz had to find a way to set her piece a part. She did so by incorporating an a cappella score. The six-piece ensemble was the sole source of sound. It’s a noble feat but also has some severe consequences. While the ensemble wasn’t comprised of extraordinary vocalists, together they sounded sweet, and occasionally eerie. But stylistically how the music is composed and arranged combined with a dramatic story, the energy on stage was naturally low. To no fault of the company, playing it any other way would have felt unnatural so you have to wonder whether the ambition Ali-Oshatz paid was worth the price of admission. Perhaps more voices and a bit more dynamic arrangements could help. While Ali-Oshatz made Myrtle and her love Clinton Bicknell the focus plot line, there was much material that was given to the other players. And it is some of the strongest in the show. That being said, the musical is about Myrtle and her fall into love and out of the world she knows. Finding a way to have the solos by the other players inform the overall action would tie the entire piece together. These moments are thematically relevant so underscoring it with Myrtle moments would be a strong storytelling device. Additionally, M, who Ali-Oshatz happens to portray, is a natural choice to be the puppetmaster of the story, controlling how the piece is told. While it would harken back to the Lead Player in Pippin, having M regulate the action would make Myrtle’s abandonment be so much stronger for M, giving her a more coherent arc. It would make sense as she is a ringmaster. Ali-Oshatz crafted a character that fit her well. In M, she was able to bring an aura of mystery and intrigue, something that this world was filled with. Individually, the players brought their own flavors but it was Thomas Rabuano as Simon-Elizabeth gave the most surprising performance. As Myrtle and Clinton, Madeline Bugeau-Heartt and Justy Kosek had nice chemistry, proving love is love. Festival settings can be hard to bring a fully realized production to life. There was a miracle on stage as director Madeline Wall energized the Kraine Theatre. Even if the character arcs where thin, Wall guided her ensemble to find powerful moments. The choreography by Kory Geller was haunting, suiting the piece well. There aren’t very many options when it comes to a rep plot in a festival yet Elizabeth M. Stewart did the extraordinary. She made good use of the stark lighting. By keeping the overall mood theatrical, those moments when the white wash stage was brought in, it looked incredible. Even the image of a tent created with a string of lights was visually interesting. This piece has a very specific feel when it comes to costumes. Visually, it needed to look right. The pieces that Wall, Elizabeth Samuels, and Virginia Wall compiled fit wonderfully. The Extraordinary Fall of the Four Legged Woman has some work to be done but there is extraordinary potential within. There is room for this piece to grow grander. And once it finds the legs to stand on, Lily Ali-Oshatz may have something special on her hands.